The following example of the media propaganda against the hunting ban has been reproduced with kind permission from the latest edition of the ACIG News Bulletin. I would like to know how many police officers were out on New Year’s Day enforcing the wholly useless Hunting Act, before deranged taxi driver Michael Atherton murdered his partner, two of her female relatives, wounded a third and then took his own life – all with a legally held shotgun. Whatever your views on the hunting of foxes with hounds – and, on balance, I’m against it – anyone of a rational disposition can see that the ban on it doesn’t work, ties up police time unnecessarily and, consequently, is an untenable piece of officious legislation. Meanwhile, what really makes the gall rise is that a sick man can be allowed to amass a gruesome arsenal of six guns, one of which – evidently a sporting gun – he then uses to slay three women and himself. We are driven apparently to pass laws to protect wild animals, while failing to enforce relatively simple laws that protect innocent human beings from mad men with guns. Ban ‘sporting guns’ I hear you cry. Nope. Anyone who has owned a shotgun, as I have, will know how difficult it can be to acquire a licence. There are pettifogging regulations, busybody inspections and seemingly unnecessary paperwork. But we put up with it gladly, because it’s supposed to prevent the unstable and unsuitable acquiring the means to commit murder and ruin lives. Why does a Reverend need a shotgun? So what went wrong? The conclusion to which we must be drawn is that the Durham constabulary are either drained of resources – what with all the following of hunts and expired car tax discs to be hunted down – or have been woefully negligent in the execution of their duty. The Rev. 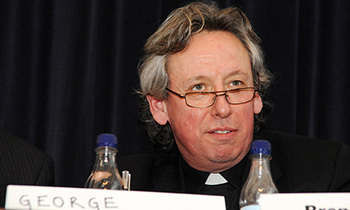 George Pitcher is an Anglican priest who serves his ministry at St. Bride’s Church, Fleet Street, London, the “journalists’ church”. One media source estimates that he earned £4m from exiting Luther Pendragon, the PR company that he co-founded. The answer to the question in the title is “NONE“. New Year’s Day 2012 was a Sunday and very few hunts in the UK meet on a Sunday. Further the shootings happened just before midnight when there were no hunts out for anyone to police! And a journalist was paid well to write this nonsense?